EASE promotes the special relationship that can exist between a person and their pet. Pets give warmth and comfort to the elderly and the ill, to children, to people living alone, to adults, basically to everyone. Companion animals offer guidance to the blind or disabled, easement to children and therapy for people with special needs. 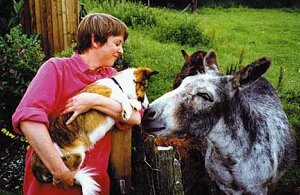 The long-term aim of EASE is to create a place where these aspects can come together in one location - where rescued companion animals of many species live together in harmony, where people with special needs spend time with animals and where children learn about their care. In the meantime we are putting in place various aspects of the people-pet relationship towards our ultimate vision. The structure and principles of EASE are based upon a template pioneered by the Template Network. Central in this are ingredients such as value for all life, adherence to natural laws, understanding of the natures and qualities of different animals, plants, colours and stones, and respect for the planet upon which we live. This is the name for a new and special coloured light system that is being developed for use in hospital rooms. Anne Sofie Pedersen from the Template in Denmark is heading up the Kaleidolight project. The Kaleidolight, which can be used by both children and adults, is placed in the ceiling above the bed and the patient can then, by using a remote control, decide which colours or colour combinations they want to have radiating down and over them. The Kaleidolight is designed to assist a patient during any difficult and long period of hospitalisation, by helping them to shift their focus away from the illness and the treatments. All the colours and combinations in the Kaleidolight are designed to have a soothing effect on the person. One of the main purposes of the Kaleidolight is to provide the patient with a way to influence the environment they are in with colours of their own choosing. A multi-disciplinary team of people involved in the fields of environment, health and design have been working to develop a technology that they believe has real potential in the worlds of health and well being. Sponsored by the Template Foundation UK, this team has created what has been named ‘The Aura Shower’, which works to clean and regulate the electro-magnetic fields of a person using one of nature’s greatest cleansing agents - running water. In July 2002 , the aura shower was constructed and is undergoing trials at the St Elizabeth’s Centre for people with severe epilepsy. James Ash, the original creator of the aura shower: “The basis of the technology of the aura shower is to do with the understandings that relate to the electro-magnetic field that surrounds a person, known as the aura, and its three levels of radiation. As we go about our lives so this radiation field, extending approximately 90 cm out from the body, can house energies or become contaminated in ways that can adversely affect all aspects of our lives - from how we think, to stress, stamina levels and general health. In the same way that we care for our bodies, and try to keep them clear from disease and dirt, so we can offer the same care towards our energy systems’. Have you ever noticed how invigorating it is to sit by a moving stream or a waterfall? This is due to the fact that water is a natural cleansing agent that can draw to itself and remove unwanted or unused energy, leaving us feeling more intact and cooler”.